Half stars?! ZOMG! I can do half stars?! I love you, BookLikes. Yeah, I still don't really know what I'm doing, but I'm going to figure out this site. I have a tumblr, but I never use it so that doesn't really help. My books are still importing over here, but I'm probably going to erase my reviews once they're here, or keep them and update them later. All (not that there are many of them) my reviews are subpar, guys, which is why I follow a bunch of eloquent people (you). While my books are making their way here I'm going to tinker around on my page and make it look pretty like others I saw. 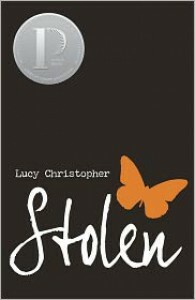 Stolen is written in second person as a letter Gemma writes to Ty, the one who kidnaps her. The writing style allows for the reader to get inside Gemma's head and to know her thoughts and feelings of what has happened to her. I honestly had trouble getting into the book because it was creepy reading about this girl's traumatic experience. So, I read the book off and on for over two weeks before I finally sat down and read through it to the end. The ending is where the written emotions of Gemma really made me feel as conflicted as she felt. The writing of the whole book is beautiful and haunting. Wow was pretty much the only word that entered my thoughts after I finished the book. Before I started to read I only knew that it was about a boy who survives a ship sinking and is stuck on a lifeboat with a tiger. 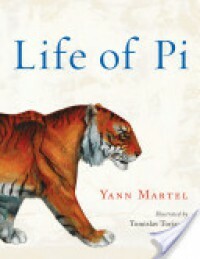 That was the limit of my knowledge to the story of Life of Pi. After I finished reading the Author's Note I was already in love with Yann Martel's writing style, and throughout the story I was reminded repeatedly how captivating Martel's prose is. I know some people talk about how the book is religious, and I myself tend to shy away from religious books. Yeah, there were talks of God and religions, but it was not preachy at all. I actually enjoyed the first part of the book where Pi discovers and practices Hindu, Christianity, and Muslim together. I know some people hated the first half of the book, but I actually enjoyed it. The pacing of the story is slow though. Life of Pi is a story that i think will stay with me for a while. While it did take me a while to actually get into the adventure of The Hobbit, as in I read a few pages here and there before putting it down and went and did other things. The story wasn't boring, but it was difficult for me to get into. 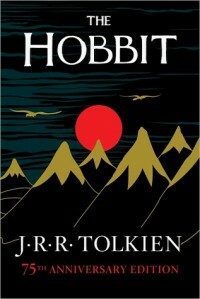 Overall, the adventure and the storytelling Tolkien delivered in The Hobbit was fantastic. My favorite part would have to be when Gollum appears and has a riddle competition with Bilbo, and that was also when the adventure picked up for me because of the introduction to The Ring. Read this book for the Vaginal Fantasy Hangout book club. Succubus Blues is a good introduction to the series because by the end of the book I have found myself invested in Georgina's story and want to read what happens next. 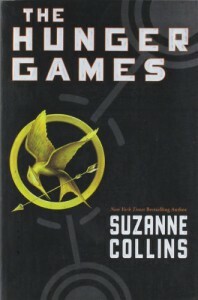 I enjoyed the book, but it kind of seemed like nothing was actually happening even though some things were happening. Y'know? I don't know. It was a slow story in the sense that nothing really major happens until the end and the rest was just Georgina dating, or her trying not to date that is. Georgina was also a bit hard to like, but by the end she endeared herself to me, which is why I will be reading the next book. 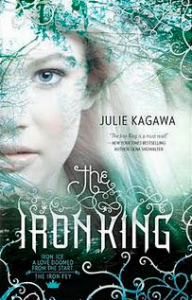 The Iron King was like a bit of a mash of The Labyrinth and Alice's Adventures in Wonderland. Nevernever (Faeryland) was an intriguing place and I really hope in the next book we see more of the world. I loved Grimalkin, Ash, and Puck/Robin/Robbie. I did not like Meghan until the end of the book when she finally started to grow a backbone and fight. She was not my favorite, but the ending made it seem as if the next book she will be more stronger and confident so I'm looking forward to reading the next one because I do want to see where the series goes. 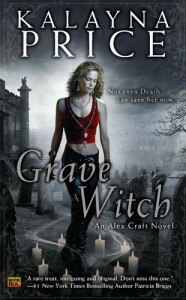 Grave Witch was an exciting read that definitely made me want to keep turning the pages to see what happens. I loved that the paranormal and "real" world mixed together in a way that worked. The characters were very likable and I cannot wait to see them flesh out in the next books of the series. While I don't like love triangles I wasn't that bothered by it here and am looking forward to read what happens between Alex, Falin, and Death. The first book in the Alex Craft series was fun and I cannot wait to continue with the series. 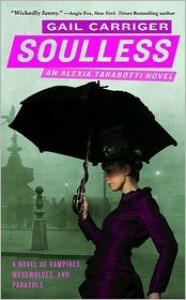 Soulless was a fun start to the Parasol Protectorate series. There was a little bit of everything in this book: romance, steampunk, urban fantasy, mystery, historical, and paranormal with vampires, werewolves, ghosts, etc. I enjoyed every bit of this story. I loved Alexia's personality and liked the fact that she was an independent, strong character. I received this book free through the Goodreads First Reads giveaway. 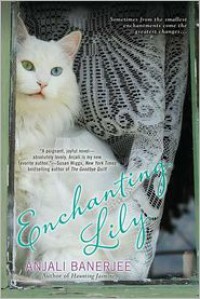 Enchanting Lily caught my attention when I saw the gorgeous white cat on the cover. The cover looked promising, and made me think the story was going to be a lovely little magical read, which it was. The story is about Lily Byrne, a widow who's trying to find her place in the world after the loss of her husband, and the place she finds is the small town of Fairport on Shelter Island. On whim, she buys a cottage and opens a vintage clothing boutique that will touch the lives of others experiencing their own personal tragedies. Lily is only part of the story; the other part is the special white cat that finds Lily. The cat unexpectedly slowly begins to help Lily heal as she tries to find the cat's owner. The story is told from both Lily and the cat's point of view, which adds a delightful depth to the story to hear from the cat's perspective. Enchanting Lily is charming with a sweet romantic center that is full of hope and a touch of natural magic. I really enjoyed the book and others who are looking for a charming, well-written, whimsical story about the journey of healing will probably enjoy Enchanting Lily as well. I enjoy each Percy Jackson book, but this has been my favorite to date. As always Percy Jackson goes on another fun, exciting adventure! I read for Vaginal Fantasy Hangout book club. 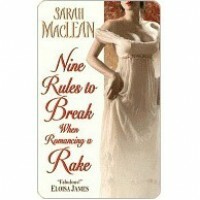 What I liked most about Nine Rules to Break When Romancing a Rake, other than the fun title, is Calpurnia (Callie). Callie is witty, intelligent, and while she has self-esteem issues she is still strong. When she realizes that she has only done what she was expected and told to do she decides to make a list of things she wants to do and experience before she is permanently put on the shelf of spinsterhood. 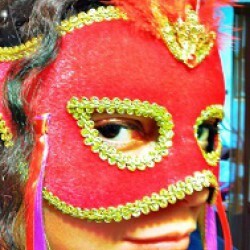 On her adventure to find herself and live life she catches the notice of Ralston, the man she has desired for 10 years. Callie and Ralston's scenes are quite steamy and fun. The whole story is just fun and delightful. I enjoyed all the characters. There are two other books in this series about Ralston's twin brother Nick, and his sister Juliana. I wish there was a book about Callie's brother, Benedick. I will check out the next book. 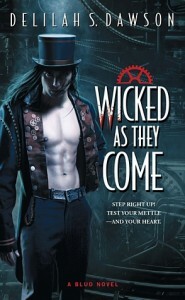 Wicked as They Come has vampires, excuse me, Bludmen, magic, steampunkery, romance, and a dash of adventure. Mix everything together and the book is an intriguing story. Letitia, the main character, as well as us readers, fall into another world called Sang where we meet Criminy, the magical Bludman. The only problem I really had was the progression of Letitia and Criminy's romance. Due to a spell/magic Criminy was already in love with Letitia, and while she did not really do the whole instant love there was still a bond she felt between them. Fortunately, Letitia did not let the "meant-to-be" love spell make any real decisions for how she felt. I bought the book when I saw it at a convention and it was being sold with the author's signature. 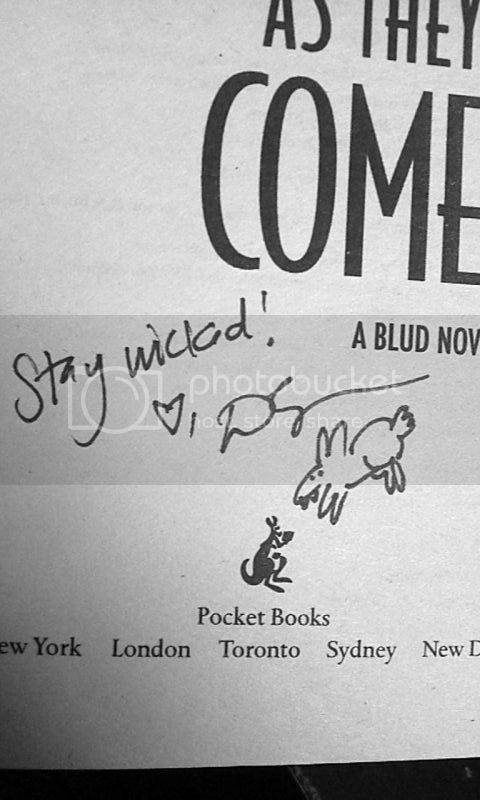 Wish I had gotten the book personalized since the author was at the convention and I saw her, but I'm a socially awkward person. Love the drawn bludbunny. I will read the next Blud book for sure. I really loved this story. There's something endearing about The Hunger Games even with it being centered around a group of kids killing each other for survival. For me, the bits of romance intertwined within the story was what had me hooked. I also liked the political side of the book. I will definitely be reading the rest of the series and I might even reread this one. Read for Vaginal Fantasy Hangout book club. 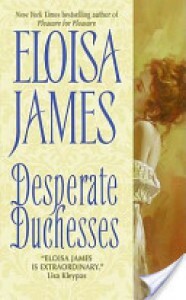 Desperate Duchesses is a sweet (and a bit silly), fluffy little story that I devoured quickly. I wasn't quite sure how well I was going to enjoy the book in the beginning because the main female character, Roberta, briefly (briefly as in they bump into each other and exchange one or two sentences) meets a man and quickly comes to the conclusion that she has fallen in love with him. Yeah, I don't enjoy the "love at first sight" or "instant love" storyline in books. Lust at first sight, now that I can believe, and there is a whole lot of lusting going on in this book. I liked Desperate Duchesses and as it's the start of a series, so I would continue on with the series to see how the characters and their relationships, like Jemma and Elijah, develop. What I love most about books that are part of a series is that the characters grow in each book. Percy has grown and learned since the first book, and is maturing well into what I believe a hero should be. 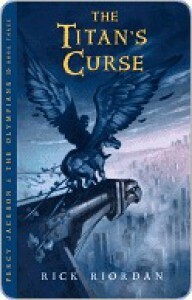 The Titan's Curse, like the others in the series, is a fun, light read. 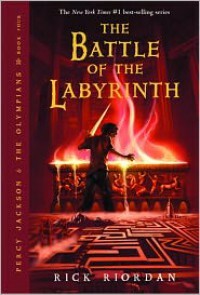 I enjoy the Percy Jackson series because I know it's going to be a fast-paced, little adventure full of Greek myths. Looking forward in continuing with the series.